My daughter turned 10 this month. Stop. The. Clock. Just yesterday I bent over her bassinet, tears streaming down my face, watching her tiny body breathe deeply in sleep, while begging God for help. I felt so inadequate to be a mother. I couldn’t believe they let me bring her home from the hospital. A decade later, I still lay in the dark, wondering what in the world I’m doing. Yet, despite my failures, she’s growing into a beautiful young girl who wants to do right and loves God with all her heart. I know this next decade will shape how she thinks about herself, the world, and God. Good grief, she might even start dating her spouse. Let’s not even talk about how at age 20 I was married. These are ten truths I want to make sure she knows as she enters this next decade of her life. 1. The most fashionable clothes don’t come from the mall. Fashion styles come and go. It’s ok to want to dress in fun clothes that reflect your personality. But always remember to clothe yourself with compassion, kindness, humility, gentleness, patience, and love. Those never go out of style. People may not remember the awesome dress you wore to that party, but they will remember if you were kind and compassionate to them. 2. Your body is a gift. As a woman you have the gift of a flexible body able to expand and change through your life stages. It’s a beautiful gift from God. Over the centuries, women’s bodies have been viewed poorly, even as dangerous. But your body is a gift. Never forget that. It will carry you through life. Respect your body and treat it well. Don’t let what others say or do, whether men or women, ever make you feel like your body is dirty or bad. Your body is precious. Anyone who doesn’t respect that doesn’t really love you. 3. True beauty isn’t found in the right hairstyle or makeup trend. 4. You’re deeply loved, but not because you do everything perfectly or because you have it all together. The most amazing thing about God is that He loved us when we didn’t deserve it. In fact, we didn’t even know Him or love Him. “ But God demonstrates his own love for us in this: While we were still sinners, Christ died for us. Romans 5:8″ We did nothing to earn or deserve His love, yet He freely gave it. So why do we think we have to perform in order to be accepted and loved? You will make mistakes. Big ones. And it will be ok. I will still love you. Dad will still love you. God will still love you. What matters most isn’t that you do everything perfectly, but that when you realize you’ve made a mistake, you own it, confess it, do what you can to make it right, and move on. Don’t dwell on it, beat yourself up, or think you aren’t loved. That’s a lie. 5. You have things to offer the world. They may not ever make you famous or make you a lot of money, but don’t miss the opportunities you have every day to use your gifts. Maybe it’s encouraging a friend, offering a smile, or helping someone do their work. Ordinary things done with compassion make a great life. 6. Friendships matter. Choose wisely. 7. Fear is a poor decision-maker. Fear is an ugly foe. It prevents us from making new friends, learning a new skill, or following a dream. Sometimes it even stops us from helping a hurting friend because we’re afraid we’ll say or do the wrong thing. Don’t let fear make decisions for you. Instead, focus on the possibilities of the good things that could happen – you might make a new friend, you could learn something new that you end up being really good at, you might help a lot of people. Then go for it. 8. Words hurt and words can heal. People will say things to you, and you’ll remember those words for the rest of your life. Some of those words will build you up and give you courage to be all that God created you to be. Listen to those words. Other words spoken to you will try to tear you down, tell you you are nothing, that you’re not good enough, that you aren’t smart or talented. Although you may never be able to forget those words, don’t believe them. They are lies from the enemy. Those people don’t want what’s God’s best for you, and they are trying to tear you down. Every time those words come to mind, ask God to help you remember who He says you are. You are chosen. You are treasured. You are loved. When you speak to others, even words that need to be hard truths, speak in a way that will promote healing. 9. Perseverance is an important part of your character. Hard times will come. You’ll experience things you think might never end. You’ll take on a new job, a new task, a new class, and be tempted to quit. Don’t. Just because something is hard doesn’t mean it’s not worth pursuing. Marriage is hard. Friendships are hard. In fact, anything worth doing is often hard. Perseverance sets you apart. Perseverance makes you strong. No matter what the end result is, whether the situation works out the way you hoped it would or not, let it result in the development of your perseverance and good character. 10. It’s never too late to try something new. We live in a crazy culture that says if you haven’t figured out what you want to be by the age of 10, you’re way behind. They think if you aren’t a child prodigy you’ll just be average the rest of your life. That’s baloney. Some of us don’t figure out what we’re gifted at until we are adults. I’ve heard of 80-year-olds who write their first novel! There’s no deadline for figuring out what you’re good at and what you love. What matters is doing your best at everything you attempt. “Whatever you do, work at it with all your heart, as working for the Lord, not for human masters, since you know that you will receive an inheritance from the Lord as a reward. It is the Lord Christ you are serving.” (Colossians 3:23-24) Remember that whatever you do, whether small or big, you’re serving God, your whole life. 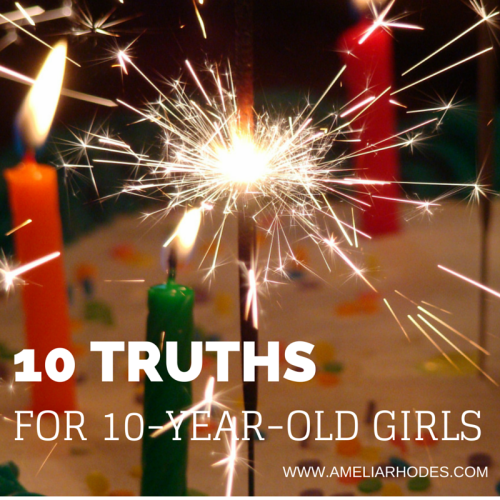 10 truths I want my 10 year old daughter to know. Fear is a bad decision maker. #Truth for young girls. Perseverance matters and 9 other things I want my daughter to know.